NDP Education Critic Marit Styles (in green coat) questioned Premier Doug Ford and Education Minister Lisa Thompson over education cutbacks. Premier Doug Ford and Education Minister Lisa Thompson blamed educators and their unions for the student walkout April 4 in an exchange with NDP Education Critic Marit Stiles during question period in the legislature. Thompson also issued a statement saying the student walkout was a “political stunt” by teachers’ unions. Later, in a radio interview, Ford doubled down on his remarks, saying “union thugs” were responsible for the student walkout on that day. You can listen to the entire segment of the John Oakley show on Global News Radio by using the Play button below, or read a summary of Ford’s remarks at this link on the Global news website. Ms. Marit Stiles: Mr. Speaker, good morning. My question is to the Premier. Today, students across Ontario will be walking out of their classrooms for a very simple reason: They want the Premier to know that they are going to fight for their future. The Speaker (Hon. Ted Arnott): I apologize to the member for Davenport. Stop the clock. The government side will come to order. The point of privilege has been addressed. The ruling has been made. Let’s move on. I apologize to the member for Davenport. The Speaker (Hon. Ted Arnott): The member for Sault Ste. Marie will come to order. Start the clock. Once again, the member for Davenport. Ms. Marit Stiles: Thank you, Mr. Speaker. The future the Premier has planned for them means fewer classes in the arts, fewer classes in the skilled trades, fired teachers and larger classrooms, and that is not something they’re going to accept lying down. What does the Premier have to say to students who are already tired of being told to expect less for their future? Hon. Doug Ford: Through you, Mr. Speaker: This isn’t about class sizes, I’ll tell you; this is about the union bosses telling the teachers and the students what to do. Our teachers have a responsibility to the parents and they have a responsibility to the students to make sure that they stay in the classrooms and teach the students. We know that the grade 6 students—50% of them—are failing math. Maybe they should keep them in the classroom to teach them more math. Maybe the teachers should focus on learning math themselves, because we know one third of those teachers can’t pass the same grade 6 math test that they’re giving the students. We saw what happened under the Liberals. We saw what happened with the big union bosses when they—I guess, there are no Liberals in here. The Speaker (Hon. Ted Arnott): The Premier will take his seat. We can’t make reference to the absence of members. The Speaker (Hon. Ted Arnott): Stop the clock. Once again, I’ll remind all members, we don’t make reference to the absence of members when they’re not in the House, for obvious reasons. Start the clock. The Premier has a few more seconds to wind up. Hon. Doug Ford: Our focus as government—through you Mr. Speaker—is making sure that we aren’t on the lowest tier in the entire country when it comes to grade 6 math students. Grade 6 math students should be at the top tier, not 50% failing math. Ms. Marit Stiles: I’m going to continue with my question to the Premier. It is not just students raising concerns. School boards are warning the Premier that his plan will have disastrous consequences for our students and their futures. Boards in Peel, Toronto, Hastings and Prince Edward have written to the government. Today, the Limestone board in Kingston and Frontenac warns that increasing the average high school class size will have “dramatic and harmful effects on students and staff.” They say as many as 80 teachers could lose their jobs in that board alone. Why is this Premier ignoring these warnings? Hon. Doug Ford: Again, through you, Mr. Speaker: As I said earlier, it’s not about class sizes, because we will have the lowest class size in the entire country. If you look at B.C., it has 30 to a class. Quebec has 32. If you look at Alberta, Saskatchewan, PEI, they have no cap. We’re proposing 28. We will still be the lowest in high school anywhere in the entire country. Our focus is to make sure we focus on literacy, on math, the skills that are going to help these students—the students up there, the students back there—to actually get a job when they come out. Use the math skills—not ignore the math skills, not get bullied by a bunch of union bosses at the teachers’ union. Let’s start focusing on the students and stop using the students as a bunch of pawns, because that’s what the union bosses are doing right now. It’s absolutely shameful that they’re using our students as a bunch of pawns. Restart the clock. Final supplementary. Ms. Marit Stiles: Mr. Speaker, do you know what’s shameful? What’s shameful is that response from this Premier and the creative math he’s using to come up with this fiction about class sizes. Boards are also noting that the government’s plan will not work for their students. Under their new plan, this government says students must complete four mandatory online courses to graduate. But in a letter to the government, the Hastings and Prince Edward school board has said, “We know that in many areas of our school board students are unable to access reliable Internet service and/or transportation to an accessible location.” I’m sure this is something that the House leader would have already passed on to the Premier. How are students supposed to complete online courses if they don’t have online access, Mr. Premier? Hon. Doug Ford: Through you, Mr. Speaker: When the students are in the classroom, they’re going to learn to make sure that they understand math skills. Every single job you go into, you have to understand—I’ll tell you a story, Mr. Speaker. Before I got into politics, I had a university graduate come by. I was interviewing this person. Out of the blue—and I’ve never done that—I said, What’s seven times seven?” Would you believe they look around for their phone to calculate seven times seven? A person who graduated from university doesn’t understand the basic times table? It’s unbelievable. But I have an idea: Through Bill 48, we’re actually getting new teachers to make sure they focus on math skills. I have an idea: Why don’t we test all the teachers rather than just the new ones on learning how to deliver math? Ms. Marit Stiles: My question is again to the Premier. This morning, the Minister of Education took to the airwaves and said she was ready to listen to students. Well, students are telling the government clearly they don’t want larger class sizes, they don’t want teachers losing jobs, and they don’t want to lose courses that teach everything from art to music to skilled trades. Those are actually courses that lead to good jobs and boost our economy, Premier. If the Premier wants a dialogue, can he start one right now by explaining why he is forcing these cuts on students? Hon. Doug Ford: Minister of Education. Hon. Lisa M. Thompson: Speaker, it’s my pleasure to rise today and talk about what we’re doing. We’re not going to be giving in to union stunts like we are seeing happening and being fostered by the members opposite. We’re not going to be teaching based on ideology and hidden agendas. We are going to be focusing on what we learned during our consultation last fall, and that is that parents, teachers and students alike want to be focusing on the fundamentals that will ensure them a great career pathway forward. That’s what we’re doing. The Speaker (Hon. Ted Arnott): Order. Stop the clock. The Speaker (Hon. Ted Arnott): Government side, come to order. Ms. Marit Stiles: Instead of listening to students, the Ford government has done everything it can to dismiss their concerns. They claim students are playing politics, they claim students aren’t listening, even as they dismiss young people speaking out about their concerns for their future. Instead of ignoring these young people, will the Premier consider the possibility that smaller class sizes, fewer teachers and fewer course options might not be a great idea? Let me be very clear. In the past, we know union bosses organized walkouts against the previous Liberal government. I’m concerned that we may be seeing the very same thing right now. Ms. Marit Stiles: Back to the Premier: Just to be clear, it’s not teachers who are walking out today; it’s students across this province. I would ask the Premier to give us the exact number of parents or anyone else who asked for larger class sizes and less teachers in our classrooms, because everybody wants to know. These students are fighting for a good education and a bright future, and I’d say that’s pretty darn resilient of them. Instead of dismissing their voices along with teachers, parents and school board voices, why won’t the Premier listen? Hon. 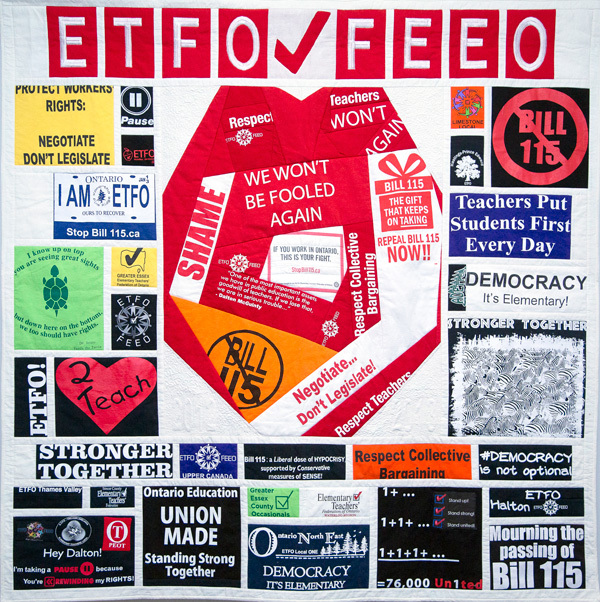 Lisa M. Thompson: Speaker, I just would like to remind the member opposite that last June, we were elected with an overwhelming mandate to fix the education system in Ontario. We need to fix Ontario. We’re going to start with our classrooms, and we’re going to make sure that we have great learning environments. That means that we’re going to make sure that teachers are focusing on the basics and the fundamentals. I am so proud that we passed Bill 48 yesterday. Every new teacher coming out of teachers’ college to register will have to pass a math test. That’s going to give confidence to our parents. That’s going to give confidence to our employers. We’re seriously considering all of our other options, because we want to make sure that the people in the classroom have the best skills, to ensure that students are learning the proper things.